Adding fresh squeeze grapefruit to the marinade gives the Mahi Mahi a light refreshing flavor without it over powering the natural flavors of the filet. My son use to be the pickiest eater. That's not to say he isn't still a picky eater, but he use to be on a strictly dinosaur shaped chicken nugget diet with a side of mashed potatoes. So you can imagine my relief when out of the blue he started trying new foods. Fish was one of the first foods he ventured into. I found it odd, considering he was such a chicken boy with a strong dislike for foods with certain textures. I don't think it was ever the flavors that he didn't like, its the way the foods felt in his mouth. To this day, he still will not eat anything that is touched by melted cheese. Regardless, once he said he'd like to try fish, it first became a project to hide the flavors of the fish so that he wouldn't turn his nose up at it. So I would cook them with flavors I knew he'd like. But then realized that going to restaurants that wouldn't work. So, I started doing what a real chef would do, and find ways to highlight the natural flavors, vs hiding them. Genius, right? Resources Defense Council (NRDC) Mahi Mahi is a a "moderate mercury" fish. They suggest you eat six servings or less during a month. Bake to eating it.... baking and grilling are the only acceptable ways to really eat Mahi Mahi. 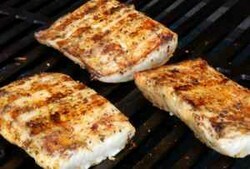 It is similiar in texture to swordfish and holds up well to grilling and marinating. It has a much milder flavor, falling between cod and swordfish. Definitely not one of those "fishy" fish. I prefer to grill mine and use flavors to highlight the natural lightness of the fish. In this marinade, I use the juice from 1 whole grapefruit. I suppose its up to you if you want to use Red or White grapefruit. In my experience, white is hard to find up here in New England, so I generally get stuck using the Red or Pink Grapefruits. No real difference, just a bit sweeter. With the grapefruit, I add in some freshly grated ginger and minced garlic. I know what dried spices are sometimes easier to keep on hand, but there is something about fresh that just tastes better. I also love to utilize the herbs in my herb garden, so I add in cilantro and chives. I don't know what it is about chives, but they give food a nice hint of onion and garlic flavor without it being overpowering or having to put a giant chunk in the food. Sometimes I feel like they have a little heat behind them. But nobody else in my family agrees on that one. Then of course, I add fresh ground pepper and some ground sea salt. Grilling Mahi Mahi isn't a science. Its rather basic. After marinading for at least 30 minutes (Be sure to flip the filet over so that both sides of the fish get the marinade), I grill on medium high for about 6 minutes on one side, and then flip and grill for about 4-5 minutes on the other side. You can check to see if its done by looking to see if it flakes apart. Be careful not to over cook this fish. A light simple marinade the highlights the fish's naturally light flavors. Take the juice from the grapefruit and mix with the freshly grated ginger, garlic, cilantro and chives. Add salt and pepper. Marinade the Mahi Mahi filets for 20 minutes on each side. On a preheated grill, spray first with cooking spray and then sear on on side of the filet for 5 minutes. Carefully turn and cook for another 5 minutes on the other side. Fish is done when it is translucent and flakes easily with a fork. Be careful not to over cook as it will get dried out. I enjoy serving Mahi Mahi with a side of grilled asparagus, sliced tomatoes, chopped cucumbers, or a fresh salad. Grill some fresh wild BC spot prawns on the bbq or steam them over a pot of water and serve them with delicious dipping sauces for a sweet succulent feast.